Once you’ve spent your way through your holiday gift list (including, why not, a couple of things for yourself because you’re the only one who knows what you really want), there can be little left for other seasonal obligations — the bubblies you really should take to the festive events that fill your dance card, for example. We have solutions — and they don’t involve anything in a black bottle. From Burgundy’s Côte d’Or come the Crémants of Albert Bichot. The Bourgogne Blanc Brut Réserve is packaged in gold and deep blue and is composed primarily of Chardonnay and Pinot Noir, pretty much as the wine would be in Champagne, though minus that occasional component, Pinot Meunier. It has been described as having a “creamy freshness,” which is difficult to dispute. We’d also add a beautiful green apple quality that persists to the bottom of the flute. Silver and blue is the festive dress of the Brut Rosé, made up of Pinot Noir, Chardonnay, and a little of Beaujolais’ Gamay for extra fruitiness. These bottles are available at Saglimbeni Fine Wines, among other specialty shops, and should weigh in around $20. Still on the Crémant kick, let’s look at another region in France, this with its unique grape blend as well. There’s less gratuitous gilding on its label, but the Gérard Bertrand Crémant de Limoux Brut Rosé Cuvée Thomas Jefferson has the additional cachet of being age-dated (2013), not a regular attribute of bargain-priced sparklers. Limoux is in the foothills of the Pyrenees, a location that favors cool-weather grapes such as the Chardonnay that, along with Chenin Blanc and Pinot Noir, is the backbone of this wine. (Nobody at the party will want to know this, so save the information for another occasion, but you might score points by mentioning that the wine was alleged to be a favorite of Thomas Jefferson’s — hence the attribution on the label.) Think strawberries and raspberries, then patés or dry hams. And expect to pay around $18. 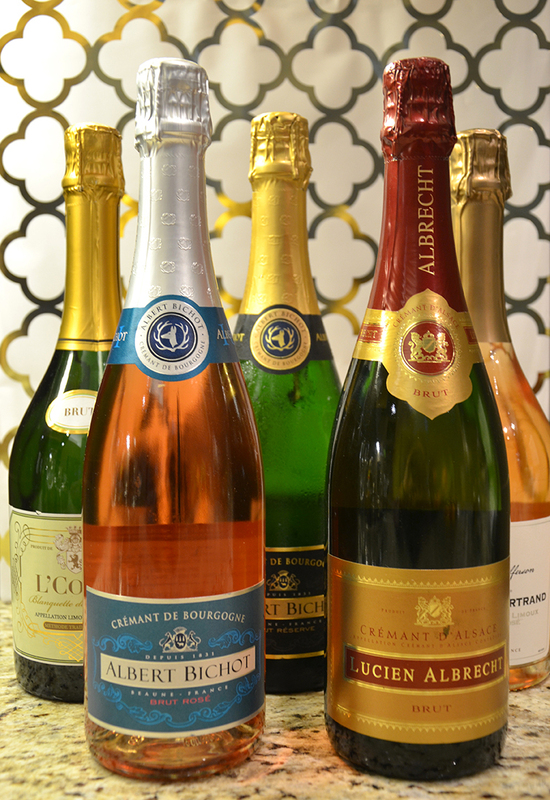 We could keep looking at Crémants; there’s a Chenin-based Crémant de Loire just for one further example, and a selection of several from different regions might be great tucked into an ice tub for your own holiday gathering. But also from Southern France’s Limoux appellation comes the L’Conti Blanquette de Limoux Brut, the Blanquette in this case being an alternate name for the locally important Mauzac grape that makes up most of this méthode traditionelle sparkler. (Again, nobody will care.) This is not a profound wine (for a little more depth there’s also a Rosé), but it will be bright, refreshing and festive in its robe of light green and scripty gold. And here’s the best part: It’s $10.99. Nobody will be the wiser. The modest extra effort you will have to make to get these last two from independent wine merchant Woody de Luna at Vintages 2.0 (210-410-0296) will be well worth it. That you have your own wine merchant ought to be worth even more at holiday gatherings.